Cold Bay is roughly 630 miles southwest of Anchorage. The Peninsula is bordered by the Bering Sea to the north and the Pacific Ocean to the south. They fish two small rivers and a couple of creeks. 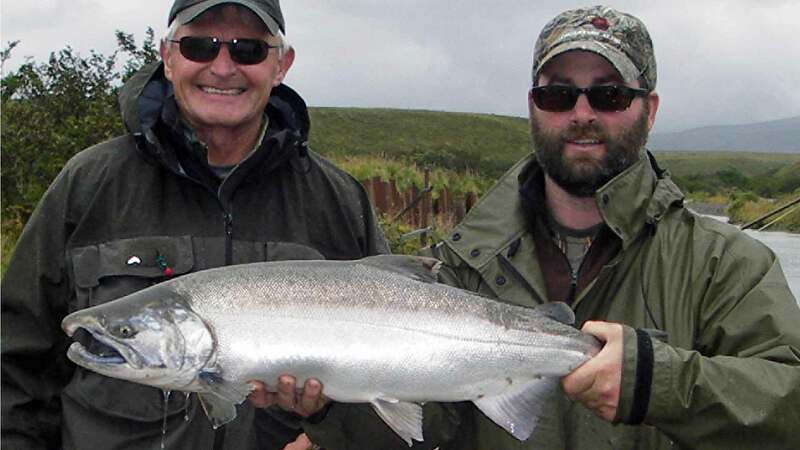 Silver salmon fishing can be exceptional. Dolly Varden are abundant and are a lot of fun on light tackle. Chum and pink salmon are also present. On the pier, there is some saltwater fishing available for cod, flounder, halibut and more. They use Achilles inflatable boats to access prime hunting locations on Izembek Lagoon and surrounding areas. They occasionally hunt the Cold Bay side of the Peninsula and nearby upland areas. 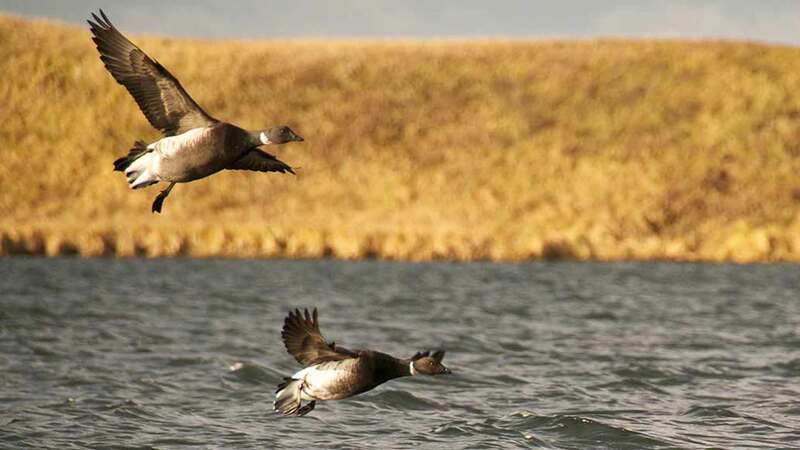 They use a large spread of custom-painted Brant decoys, Canada goose decoys, and duck decoys to lure all of these species within close range. 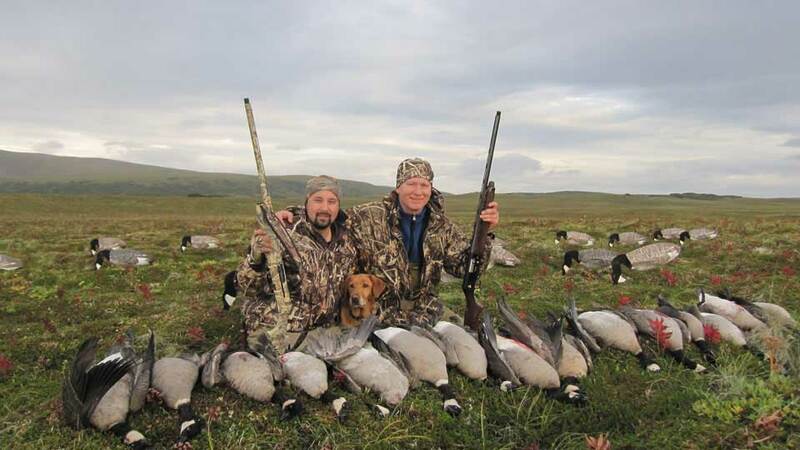 They use the best gear possible to make your hunt more successful and enjoyable. 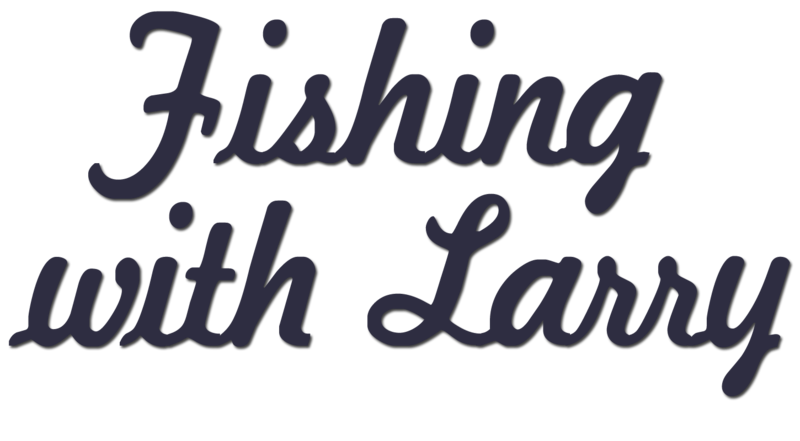 They have a wide variety of hunting and fishing available and will cater the hunting and fishing to each group’s goals. Black brant are the most abundant species of waterfowl in the Cold Bay area. Izembek Lagoon offers the best black Brant hunting anywhere. Taverner cackling geese are also very abundant. Pintails are by far the most abundant puddle duck species in the area. They also have good numbers of mallards, wigeon, and green-winged teal. Ptarmigan are plentiful on the tundra in the Cold Bay uplands. • The first three weeks of September are best for the Cast & Blast. 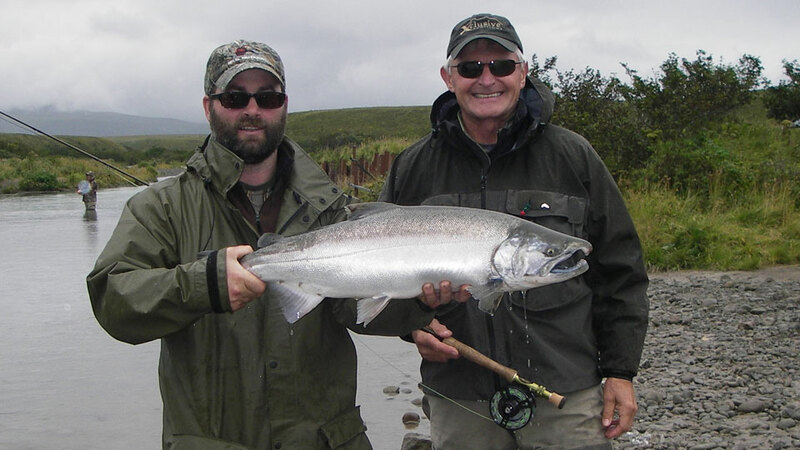 • September 25 - October is great hunting, some steelhead, a few silvers and dollies. 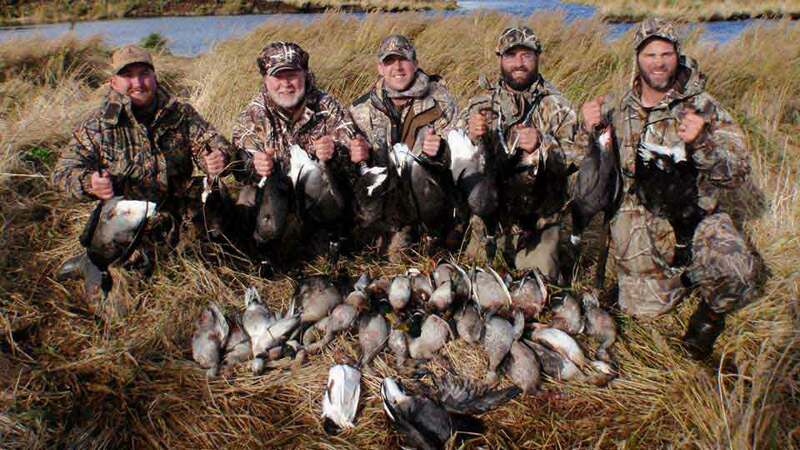 • November and December: trophy Brant, sea ducks, ptarmigan plus other ducks. • A maximum of six guests per trip. 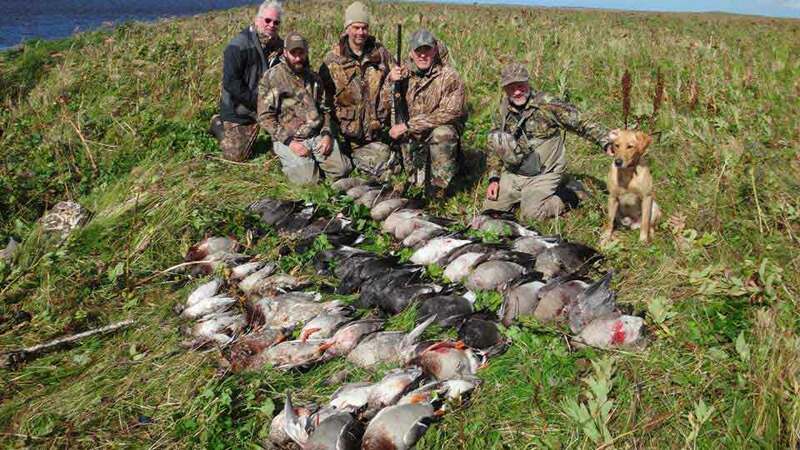 I hosted a group of hunter/anglers at Four Flyways Outfitters in Cold Bay, Alaska, September 7-13, 2014. For our stay, we had a real mixed bag. The first evening we went out for brant on Izembek Lagoon. We split up into two groups to keep the birds moving and set out a few brant decoys. We ended up with near limits on the brant and a couple of Canada geese. 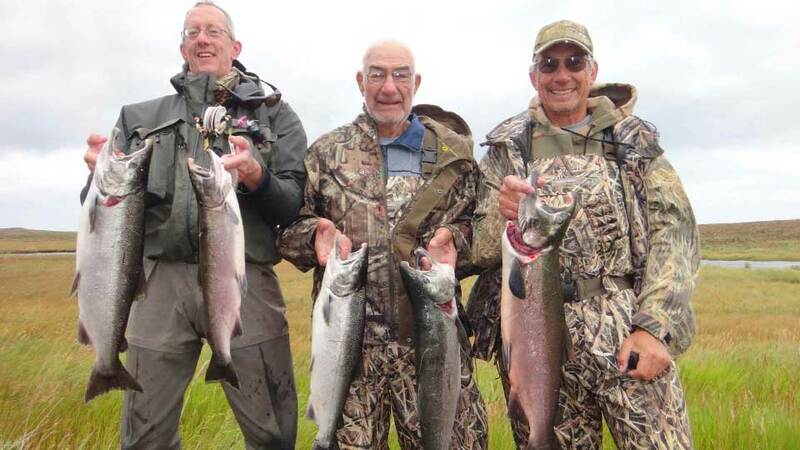 Most of the group fished for silvers in a couple of the local streams the next morning. We caught some nice fish up to 13 lbs on flies and lures. The flies outperformed the lures most of the trip. We took the salmon down to the pier to fillet them and brought some outfits to fish for cod from the pier. The cod fishing was amazing, using pieces of salmon belly or chunks of cod on a jig-hook or circle hook rig. Some of the guys caught at least 20 in a couple of hours. We shot a few ptarmigan while driving from one location to another in the Izembek Lagoon Refuge. The ptarmigan were brown on top and were starting to turn white on the underside. We did a couple of brant shoots from a layout boat with decoys near the boat. 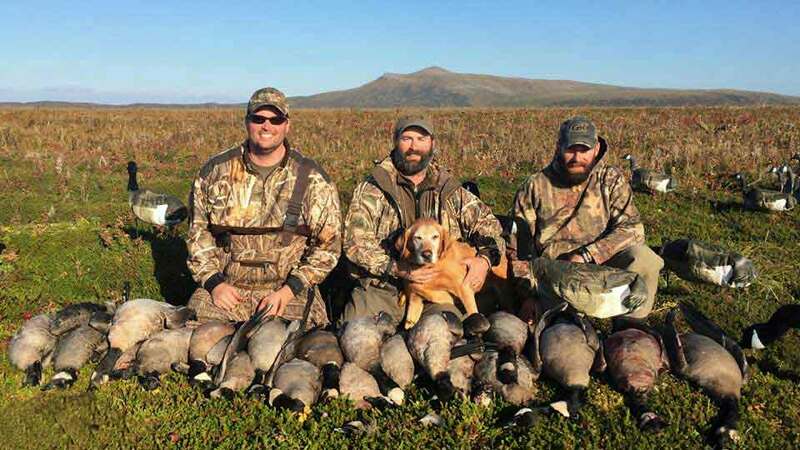 What an effective method of hunting these open water birds. They would come right into the decoys and not even pay attention to the gunner in the layout boat until it was too late. We had a couple of days where the wind was blowing too hard to take the boat, and we hiked a couple of miles or more into some ponds or along the lagoon for ducks, geese, and brant. One of those days six of us shot 56 mallards, teal, pintails, brant and Canada’s. The staff barbecued some of the brant and teal, and we had cod, fish, and chips. The brant were amazing. They are the best eating waterfowl I have ever had. For those of you who would like a mixed bag Cast-and-Blast type trip, you can’t beat the options at Four Way Outfitters. Lodging is located in the town of Cold Bay, within walking distance of the airport, city library, and the Bearfoot Inn’s grocery and bar. Double-occupancy guest rooms. A phone is available in the common area of the lodge. Guests should bring calling cards for long distance calls. Satellite TV is provided in the common area. Wi-Fi access is available at the lodge in the morning during breakfast and in the evening for a limited time. A warm space for drying your gear is available with a separate dryer for coats, hats, gloves... as well as boot dryers. The new location is warm and comfortable. Ground transfers from the main airport in Cold Bay, lodging, meals, fully guided hunting/fishing, tagging, all transportation to and from hunting and fishing areas, freezing and packaging of one box of fish and one box of birds (two boxes total) for the trip home. Airfare, hotel nights and meals in Anchorage, if necessary; roundtrip travel between Anchorage and Cold Bay, small game hunting license (approx. 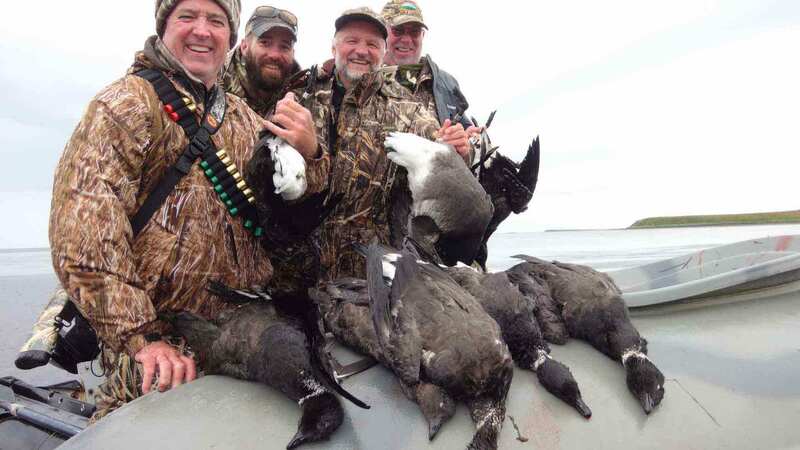 $60.00), federal waterfowl stamp ($25.00), state waterfowl stamp ($10.00), non-resident 7-day fishing license ($70.00); gratuities for guides and staff; and gun rental fees and shells.